Welcome to the Ninja Power slots review. Slotland casino released the Ninja Power slot machine in December 2016. Above all, this was exclusive to the Slotland casino brand but this amazing new game with a Japanese Anime theme was a big hit. Slotland decided to export the electronic gambling machine to their sister WinADay casino in April 2018. Slotland and WinADay now accept Bitcoin, Litecoin and Bitcoin Cash digital currencies. Above all, Slotland and WinADay casino games are unique. Some of their games are amazing and come with cool features like Random Sticky Wilds, Bonus Retriggers, and Bonus Scatters. Most importantly, the Ninja Power slot machine has all these features and more! In contrast, the only downside is that the game doesn’t have a multiplier. This five reel electronic gambling machine offers forty pay lines of pure Japanese Anime fun! Win up to 25000 coins playing this fixed coin jackpot game but keep your eyes open for more ways to win! 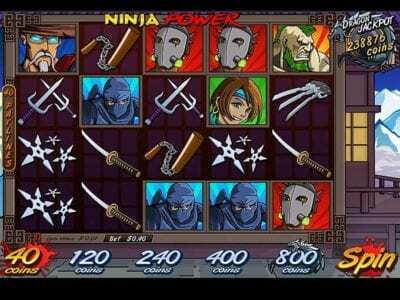 The Ninja Power slots game offers a vast betting range. Above all, you can choose anywhere from one penny up to eight dollars per spin. While you spin the reels playing Ninja power slots, you will see an actual Ninja come out from behind the screen and throw a Chinese Star when you score a winning combination. Overall, the 3D graphics in this game are great. However, it does not have a progressive jackpot. Play The Electronic Gambling Machine At Slotland Or WinADay Casino? WinADay casino is known for having big progressive jackpot games, however recently, their newer games have fixed coin jackpots. In contrast, when you read the games review on the “Slotland casino website” it says the electronic gambling machine features a “progressive Dragon Jackpot.” You may want to play the game at Slotland instead of WinADay casino but first, check with customer service. If you play the Ninja Power slot machine at WinADay casino, you may miss out on the progressive Dragon jackpot. Nevertheless, you will be pleased with the free spins bonus game, sticky wilds, and the bonus scatters. Win the five thousand fixed coin jackpot when you bet the maximum and land five of the sticky wild symbols.